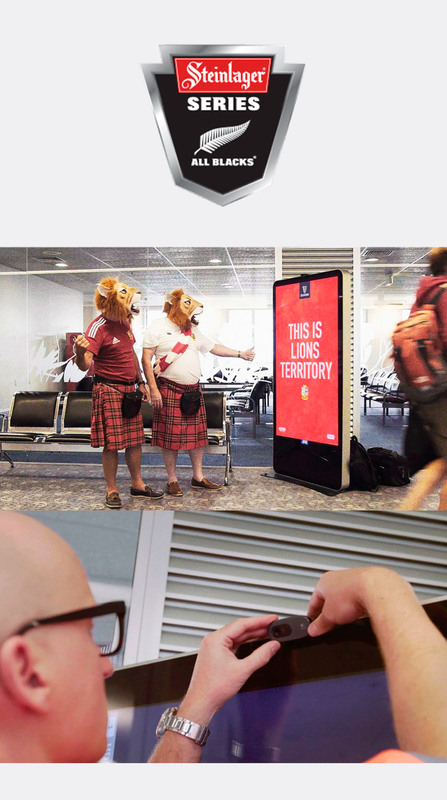 The British & Irish Lions only come to NZ every 12 years, and official All Blacks partner Steinlager wanted to do something memorable for their 2017 tour. Drawing on the strength of the supporters and the hype surrounding the teams, they invited their rivals, Guinness (the official sponsor of the British & Irish Lions) to a ‘Fight for Territory’. Leveraging the high dwell times at Auckland Airport, the campaign encouraged supporters to stand in front of one of the 65 interactive digital screens positioned throughout the terminals. Utilising bespoke image recognition software, the screens changed before their very eyes. To drive engagement further, mobile WAP technology made it possible for sports fans to completely override every sign across both terminals instantaneously. To make this possible, we built a widget on the Aerva Digital Signage CMS that runs the APNO platform and automatically switched over the creative. “We were blown away by how flexible and collaborative APN Outdoor were, and how excited they are to challenge and stretch the legs of their own systems. It was a total collaboration, with them dedicating a portion of their team to join ours to really bring the campaign to life,” - Mike Felix, Creative Director, DDB.